I am so glad that warm days are here again! Being a Florida girl, I tend to get the winter blues pretty badly. Don’t get me wrong – I love the cold weather and snuggling up under a pile of blankets, but the lack of color and vibrancy gets to me. A few weeks ago, I had reached my breaking point with all the gray, dreary days. I had to do something, but couldn’t figure it out. And then it hit me out of the blue. I needed a pinwheel wreath. Something that would counteract all the icy weather. Something that screamed spring, cool breezes, sunshine and fun. 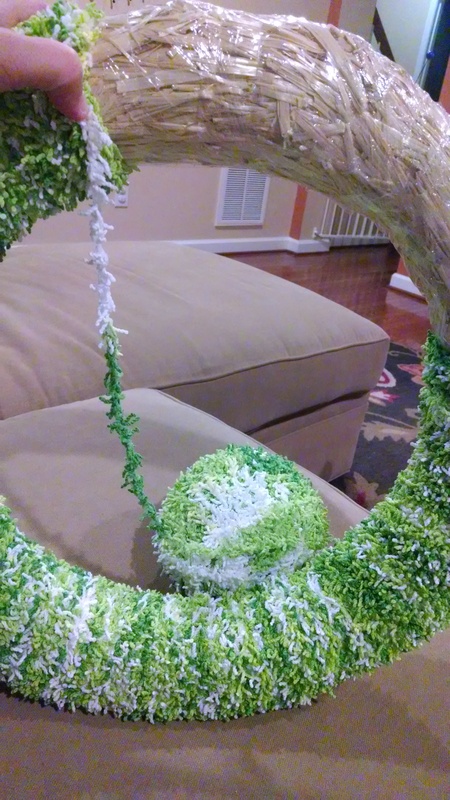 The more I thought of it, I also pictured soft grass and lots of color in the form of a yarn wreath. Two things stopped me: 1) I am absolutely not a paper crafter, and 2) I vowed I’d never ever make a yarn wreath after getting overly annoyed with the process on my first try after only getting about an eighth of the way around. 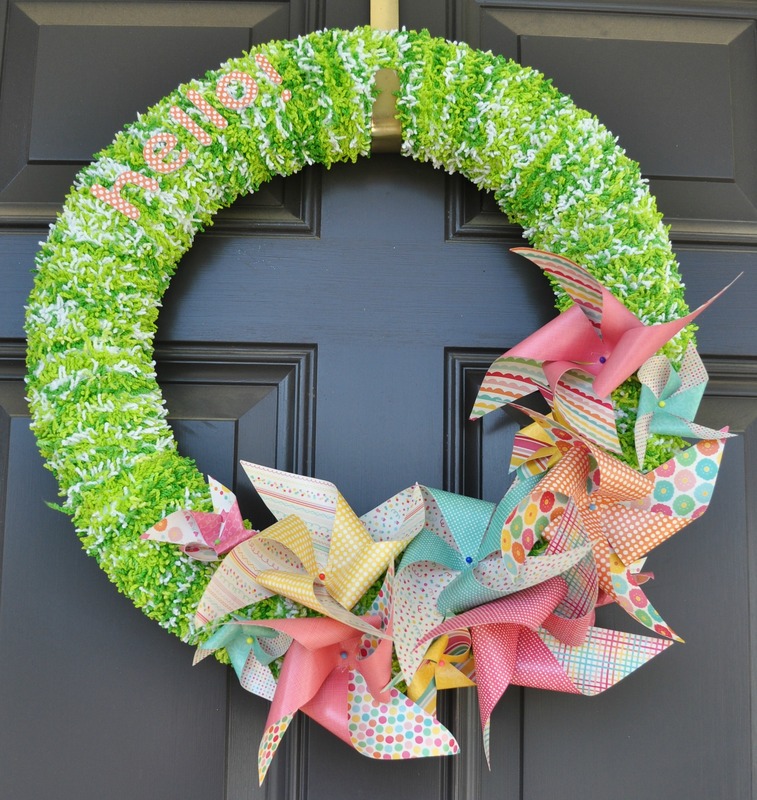 So a yarn wreath with paper pinwheels seemed like the most intimidating craft project ever. Still, the idea kept nagging at me, and I knew I had to do it. I found gorgeous fuzzy yarn in different shades of springy green and white. Wrapping the wreath wasn’t so annoying this time around. A little time-consuming, but not bad. I guess these days, after spending my daylight hours running after two kids, I welcome anything that is calm and monotonous in my down time. 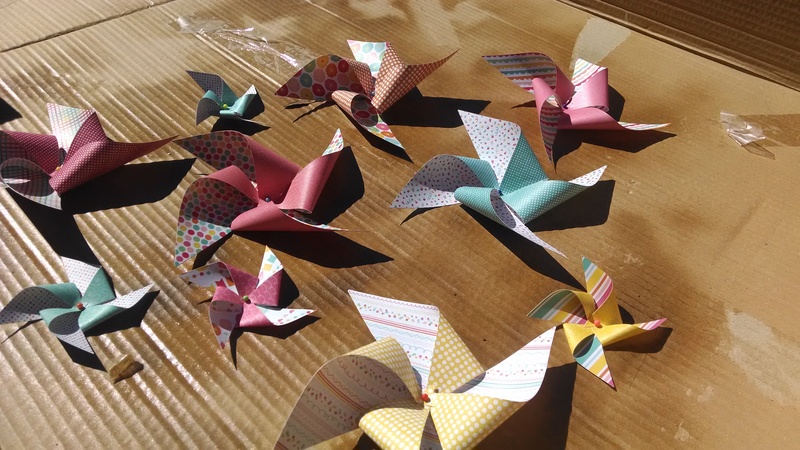 I then made pinwheels from double-sided scrapbooking paper in two sizes using 6×6 and 3×3 squares and used my sewing pins for the center. I sprayed the pinwheels with super high shine modge podge spray to protect them from the elements a little bit. I did two layers on the back, and then about five on the front. You don’t need to do that many layers on the front, but I loved how shiny it looked and kept doing more. It almost looks like plastic. So cool. Once they were dry, I pinned them into place on the wreath. It needed something more, so I thought a fun ‘hello!’ would be cute. I used shrink plastic (also known as Shrinky Dinks) and my Slice cutter to cut out four-inch letters, colored them in with a purple marker, baked them and hot glued them onto the wreath. 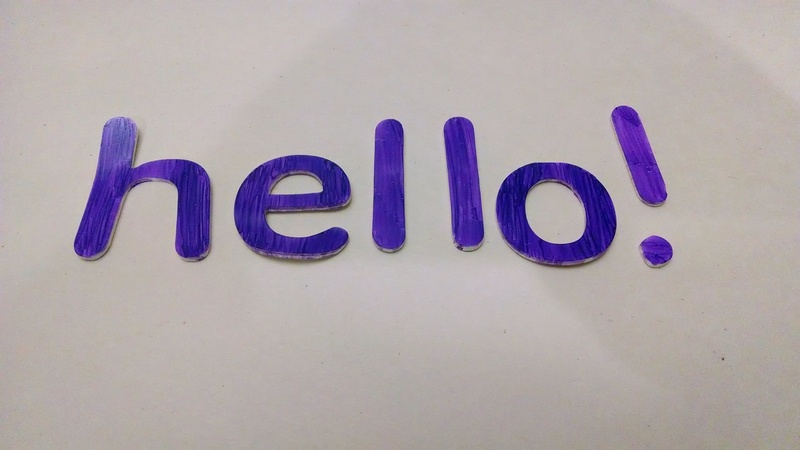 Cute, but… I wasn’t loving the purple letters. After a week or so, it really bugged me and I took it down until I could figure out what to do. It looked too plain without the letters, but I hated the purple. I tried painting them yellow, but it didn’t work. Finally, I modge-podged some extra paper from the pinwheels and they became orange with white dots. 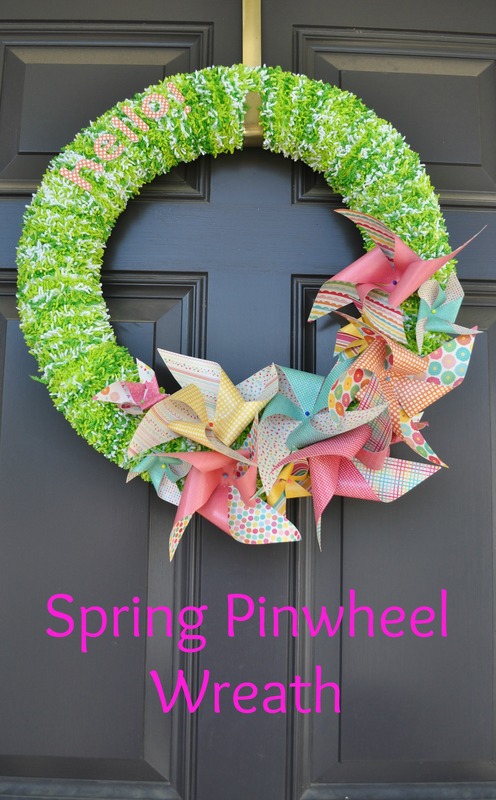 This entry was posted in crafts, diy, home and tagged pinwheel, pinwheel craft, pinwheel wreath, spring craft, spring decor, spring wreath, wreath, wreath DIY, yarn, yarn craft, yarn wreath on April 15, 2014 by aliciamariel.